Melusine live deep in the ocean, though they often live in settlements with merfolk, they just as often live alone as hermits or travellers. They have two tails and winglike back fins, webbed fingers, and horns. Melusine can breathe air or underwater, but they typically avoid land where possible, preferring the ocean depths. They can scrabble around on land with ther tails if need be, though. Melusine tend to be extremely talented when wielding magic, and can even create fire underwater. The patron god of the melusine is Leviathan, the God of Water. The average lifespan of a melusine is 120-150 years. Melusine are a secretive race. 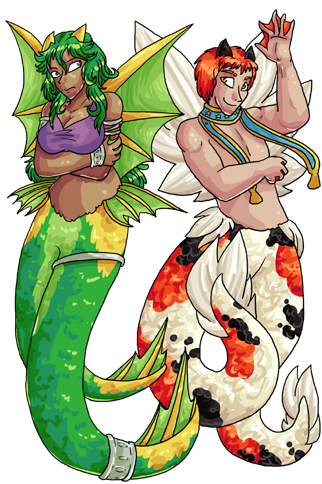 They don't often have very much to do with land-dwelling races, and mermaids don't often talk about melusine as though they are separate to them, preferring to think of all underwater-dwellers as pretty much the same. Melusine have been around for at least as long as humans have, but generally like to keep to themselves.